Woohoo! With nine restaurants earning a place on the 2015 list of Asia's 50 Best Restaurants, Hong Kong is doing fantabulous. Now in its third year, Asia’s 50 Best Restaurants, sponsored by S.Pellegrino & Acqua Panna, revealed the 2015 list of winners at an awards ceremony at Capella Hotel, Singapore. Chef Richard Ekkebus of Amber had his moment in the spotlight. The respected culinary master is the 2015 recipient of the Chefs’ Choice Award, sponsored by Nespresso, an honour voted for by his peers. Gaggan in Bangkok secured the No.1 spot, claiming the much-coveted title of The S.Pellegrino Best Restaurant in Asia. Ranked No.3 at the Asia’s 50 Best Restaurants awards last year, Gaggan debuted on the World’s 50 Best Restaurants list in 2014 at No.17. Other Honourees included Amber(No.6), 8 ½ Otto E Mezzzo Bombana (No.8), Fook Lam Moon (No.15) and L’Atelier de Joël Robuchon (No.17). Tenku RyuGin climbs 26 places to No.24 while The Chairman makes a welcome return to the list at No.35. Macau is represented by Robuchon Au Dome (No.23), rising 16 places from 2014. The 2015 list of Asia’s 50 Best Restaurants features eight new entries, including first-time entries from the Philippines (Antonio’s, No.48) and Cambodia (Cuisine Wat Damnak, No.50). China boasts 16 restaurants on the list, followed by Singapore and Japan with 10 and eight respectively. Securing the No. 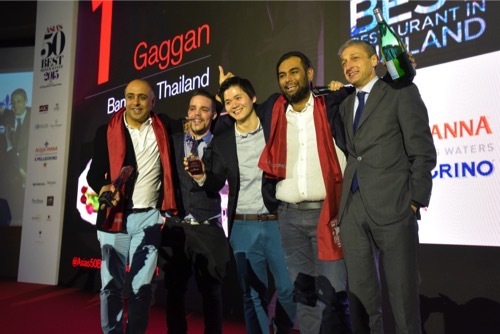 1 ranking, Gaggan is also awarded The S.Pellegrino Best Restaurant in Thailand. Chef Gaggan Anand opened his eponymous Bangkok restaurant in 2010 with a vision to reinvigorate Indian cuisine by incorporating modernist cooking techniques. 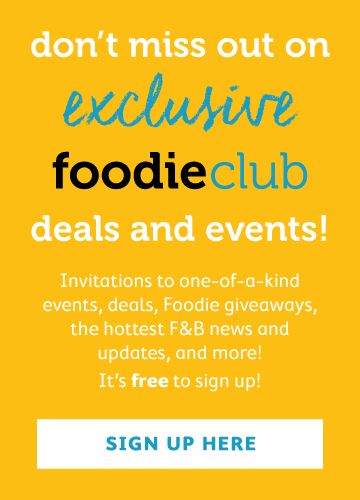 His passion, energy and creativity are evident in every aspect of the dining experience, from the colonial-style setting to the molecular twists added to traditional Indian dishes. 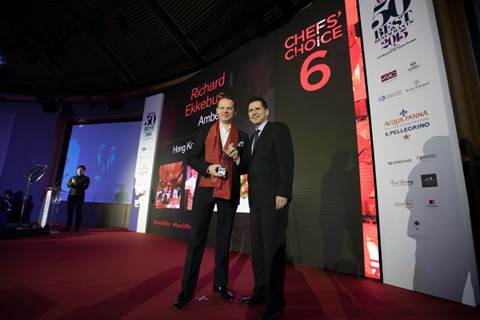 Richard Ekkebus (Amber, Hong Kong) is the 2015 recipient of the Chefs’ Choice Award, sponsored by Nespresso, at Asia’s 50 Best Restaurants awards ceremony. The Dutch-born culinary director of Amber, in Hong Kong’s Landmark Mandarin Oriental Hotel, is recognised by his fellow chefs as a master craftsman. Ekkebus has guided the restaurant to the top table of gastronomy, gaining respect and admiration as a chef and as an inspirational leader. 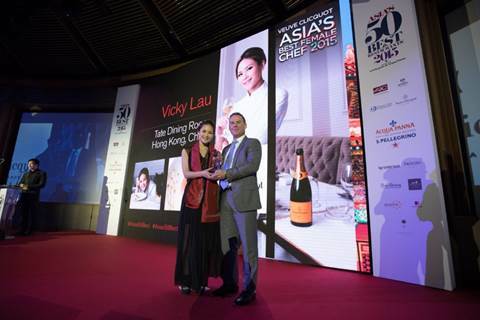 Other honourees include Chef Vicky Lau of Tate Dining Room & Bar in Hong Kong who is named Veuve Clicquot Asia’s Best Female Chef 2015. Chef Tetsuya Wakuda of Waku Ghin in Singapore is the worthy recipient of The Diners Club® Lifetime Achievement Award. Thailand is also represented by 2014 winner Nahm (No.7), Eat Me (No.25), Bo.lan (No.37) and Issaya Siamese Club (No.39). Ultraviolet by Paul Pairet (No.3) in Shanghai is named The S.Pellegrino Best Restaurant in China. Among China’s other entries, Chef Tony Lu’s Shanghai establishments fare strongly, with Fu1015 (No.16) rising 10 places and the newly-opened Fu He Hui making an impressive debut at No.19, picking up the Highest New Entry Award, sponsored by LesConcierges, in the process. Hakkasan (No.46) in Shanghai is the other new entry from China. Rising one place from its 2014 ranking, Restaurant André (No.5) retains the title of The S.Pellegrino Best Restaurant in Singapore. The new addition to Singapore’s restaurants is Burnt Ends (No.30), while Osteria Mozza (No.45) returns to the list. For a third consecutive year, Narisawa (No.2) is named The S.Pellegrino Best Restaurant in Japan. Korea’s influence on Asia’s dining scene continues to grow with two new entries, namely Ryunique (No.27) and La Yeon (No.38), the latter earning the One To Watch award, sponsored by Peroni Nastro Azzurro. Building on the success of his 2014 debut, Chef Jungsik Yim’s flagship Seoul restaurant, Jungsik, rises 10 places to No.10, earning the title of The S.Pellegrino Best Restaurant in Korea. For the first time, Indian Accent (No.22) claims the title of The S.Pellegrino Best Restaurant in India. The country is also represented by Wasabi by Morimoto (No.29) and Bukhara (No.41). A new entry to the 2014 list, this year Le Moût ranks at No.26, retaining its title as The S.Pellegrino Best Restaurant in Taiwan. 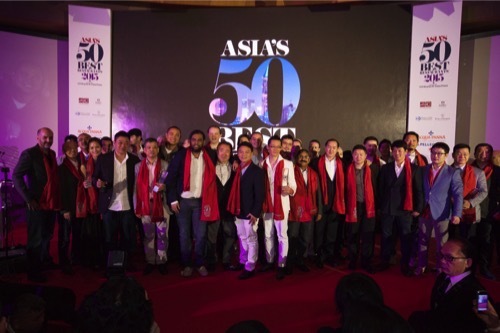 Asia’s 50 Best Restaurants also recognises Nihonbashi in Colombo (No.31) as The S.Pellegrino Best Restaurant in Sri Lanka, Antonio’s (No.48) in Tagaytay as The S.Pellegrino Best Restaurant in the Philippines and Cuisine Wat Damnak (No.50) in Siem Reap as The S.Pellegrino Best Restaurant in Cambodia. Pastry connoisseurs queue up daily at Hidemi Sugino’s eponymous Tokyo patisserie to experience his delicate, inspired creations. Trained in France, his signature mousse cakes delight with their rich textures and original combinations. Chef Hajime Yoneda continues to impress diners with his dedication, artistry and command of French and Japanese cooking techniques. His eponymous Osaka restaurant rises 28 places this year, from No.42 in 2014 to its current ranking at No.14. Chef Tony Lu continues to reinvent modern Shanghainese cuisine with his vegetarian restaurant, Fu He Hui. Entering Asia’s 50 Best Restaurants list at No.19, Fu He Hui showcases Chef Lu’s inventive combinations, respect for ingredients and finely honed skills. La Yeon in Seoul makes its debut on Asia’s 50 Best Restaurants list at No.38. Serving Korean cuisine in a fine dining setting, La Yeon uses seasonal ingredients to present traditional dishes with impeccable style and refinement. sponsored by S.Pellegrino & Acqua Panna.